“The more things change, the more they stay the same!” This can be true of both life and fishing, and a good example is line. When braided Dacron was introduced around 1950, it was a modern marvel and a big step up from previous silk and cotton lines. Although monofilament was introduced only a few years later, early products were too springy and stiff. Not until better refined monofilaments like Stren hit the market did anglers switch en masse to mono. It was thinner, more abrasion-resistant, maintenance-free, had better knot strength — and was almost invisible. 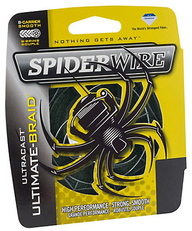 Mono ruled the roost until the 1990’s, when advanced braids like Spiderwire made from super-fibers such as Dyneema, Kevlar, and Spectra hit the market . . . bringing fishing lines full circle back to braid! Braided line is much thinner than monofilament, offering improved line handling and spool capacity. 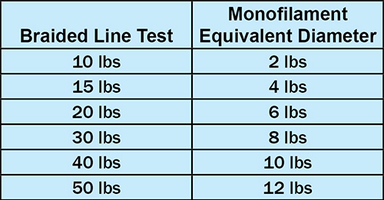 The biggest advantage of modern braids is their small diameter compared to monofilament lines. For example, 20-pound braid has the diameter of only 6-pound-test monofilament. This offers the best of both worlds with amazing strength, plus the smooth handling, higher line capacity, and longer casts of a much lighter line. If you are a new braid user, however, you have a few new tricks to learn. 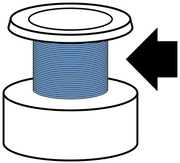 First of all, super-slick braided lines will slip on the shaft of the spool. To prevent this, try putting a small backing layer of monofilament on the reel first, then tying and spooling on the braid. Some manufacturers even include foam tape with their lines to serve as spool backing. Loosely wound braid on a spool can dig down into itself and bind, so when you spool up apply more line tension than you may be used to. You also can’t use braid on cheap or older rods with chrome-plated wire guides. Most modern ceramic or metal guides will handle braid without grooving. But, if you’re thinking of using braid on an old rod or one pulled from the bargain barrel, be aware of this potential problem. Check the tip-top guide in particular. If your braided line is breaking unexpectedly, this might be another sign that it is grooving your guides — which are abrading and cutting the line in return. If this happens, it’s probably time for a new rod. The same applies to older spinning reels, too. Modern reels with roller guides will handle braid, but your old spinner with a fixed, chrome-plated line roller might start grooving. Watch for this and if you see grooving, it’s time for a new reel. Another fact to keep in mind is that even though that braided line might be the diameter of 6 pound test, it’s actually 20-pound test. So it might cast just fine on a light rod and reel designed for 6-pound monofilament, but neither of those components may be able to handle 20 pounds of strain if you have the drag cranked all the way down and hook a large fish. 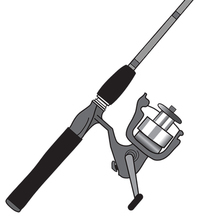 You can break a rod or warp a reel spool if you don’t select and use a rod and reel rated for braided line. This is more of a factor with older gear, but even with a modern outfit be sure to check the maximum recommended line test. One of the few potential disadvantages of braid is how limp it is. While this is a plus when casting, the line can wrap your rod tip or tangle much more easily than mono. If you do get a tangle, braid also welds itself into a permanent knot much more readily than mono. Braided lines cost more than monofilament, and you don’t want to discard 30 feet of good line because you can’t untie a knot that develops that far back on the spool. Be careful not to accidentally pull a tangle tight when you get one. While somewhat stiffer braids are available, many anglers prefer the silky-smooth way that limp braid handles. Despite this limpness, an advantage of braid in most situations is the fact that it has almost no stretch. Monofilament is quite stretchy, evident to any angler who’s ever had to break a mono line off a solid object such as a submerged stump. Braid, on the other hand, is tight as a wire — excellent for strike detection, and for solid hook-setting through thick Texas-rigged plastics into tough fish mouths. Most anglers will probably notice a nice improvement in their hookup ratio when they try braid. So if your fishing line hasn’t come “full circle” yet, there are lots of reasons to give braid a try! The next issue will cover more braid topics, including knots.